Arizona Fighting Opioid Crisis With Better Data, More Funding : Shots - Health News Arizona is among the states that have declared the opioid epidemic a public health emergency, to help with funding and access to data. President Trump now says he'll declare it a national emergency. 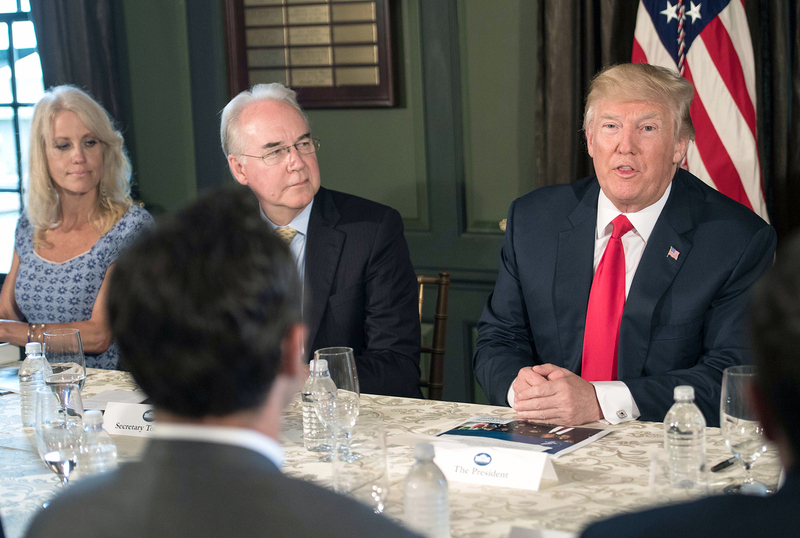 After a briefing Tuesday on the opioid crisis, President Trump remarked on its severity but did not offer many specifics on tackling the problem. Two days later, he said his administration would declare a national emergency. Just two days ago, Health and Human Services Secretary Tom Price said such a declaration is usually reserved for "time-limited" problems such as the Zika outbreak and that the administration believed they already had the resources and focus needed to tackle the problem. But he did add that "all things are on the table for the president." Trump's commission on opioids, chaired by New Jersey Gov. Chris Christie, had recommended that the president declare a national emergency in its interim report last week. The report also recommended increasing access to addiction treatment and to naloxone, the drug that can reverse an overdose. While there has been debate among addiction treatment specialists over what a national emergency declaration would achieve, a handful of states have found the move helpful. The health news website STAT reports that six states have used disaster or emergency declarations in order to take more aggressive measures to fight opioids. Arizona Republican Gov. Doug Ducey signed an emergency declaration in June, after the state reported that 790 Arizonans had died from opioid overdoses in 2016, an average of more than two per day. "What this does is allows us to use additional resources — so additional funding, additional personnel," Dr. Cara Christ, director of the Arizona Department of Health Services, told All Things Considered host Audie Cornish. With the emergency declaration, Christ says the state has been able to train law enforcement on the use of naloxone, which helps reverse overdoses, and develop opioid prescribing guidelines. They've also gotten access to better real-time data about the epidemic, including the number of overdose deaths by county and the number of doses of naloxone administered outside of hospital settings. Previously, Christ says, there was a lag of 6 to 18 months in data reporting, which made responding to the crisis harder. Asked about the renewed emphasis on law and order in dealing with the crisis, including from President Trump himself, Christ says she does see an important role for law enforcement in addressing the illegal supply of drugs. Still, she says, it's important to treat drug addiction as a chronic disease rather than a crime. "We don't want people to feel afraid of going and seeking help and calling in the middle of an emergency," she says. "You wouldn't hesitate in calling when someone has a heart attack. You should call when somebody has a drug overdose and help that friend or loved one get into treatment." In his remarks Tuesday, Trump noted that the best way to prevent addiction and overdoses is to keep people away from drugs in the first place. "If they don't start, they won't have a problem," he told reporters. "So if we can keep them from going on and maybe by talking to youth and telling them, 'No good. Really bad for you in every way.' But if they don't start, it will never be a problem." Christ says what's so challenging about the opioid epidemic in the U.S. is that most people never started out intending to use illicit drugs. "These were drugs that were started as being prescribed by their physician to treat pain or a medical condition or after surgery," she says. "So we really need to work with our health care providers to prevent people from becoming dependent and addicted." All Things Considered editor Jessica Deahl contributed to this story.